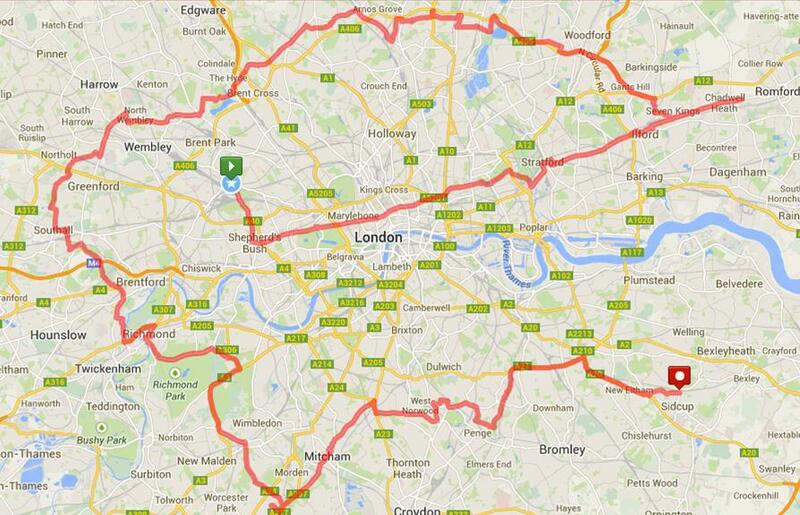 The route cycled, which covered all the boroughs of London (click for larger image). 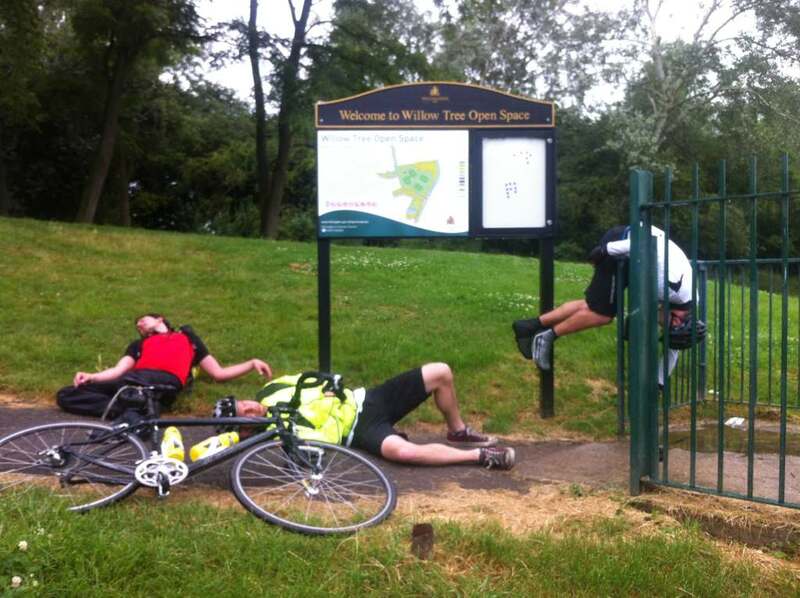 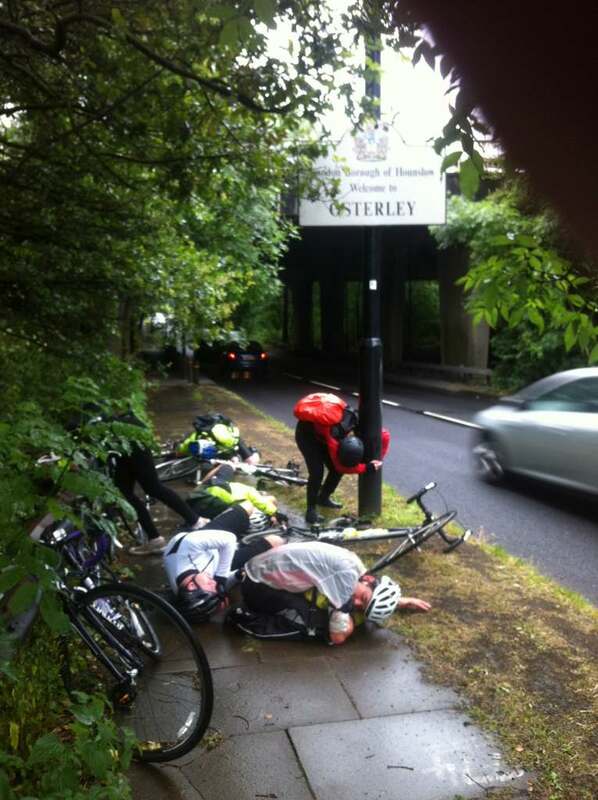 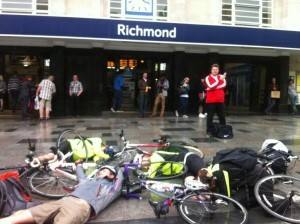 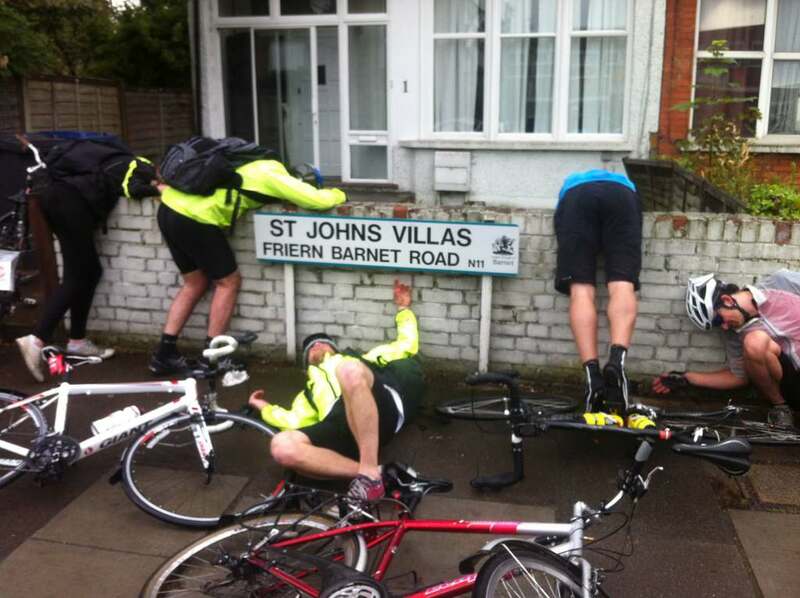 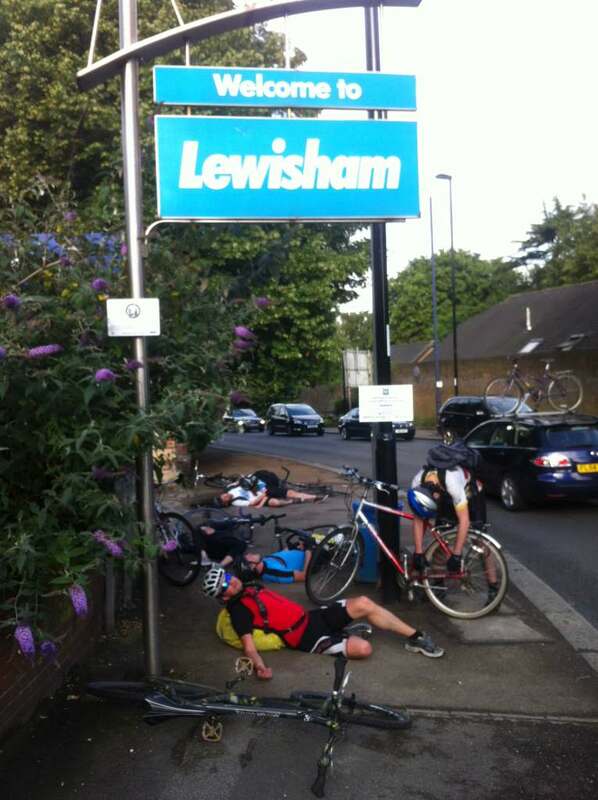 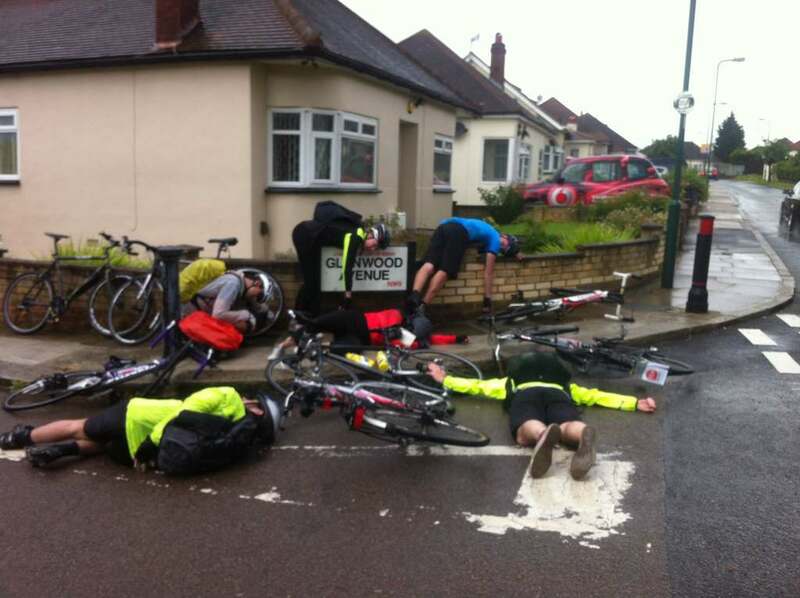 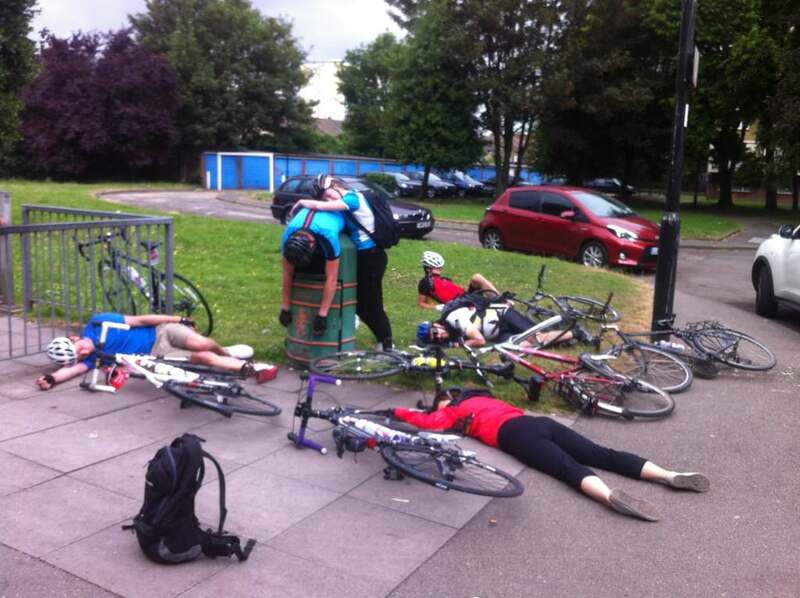 On Saturday 28th June we* Cycled The Boroughs. 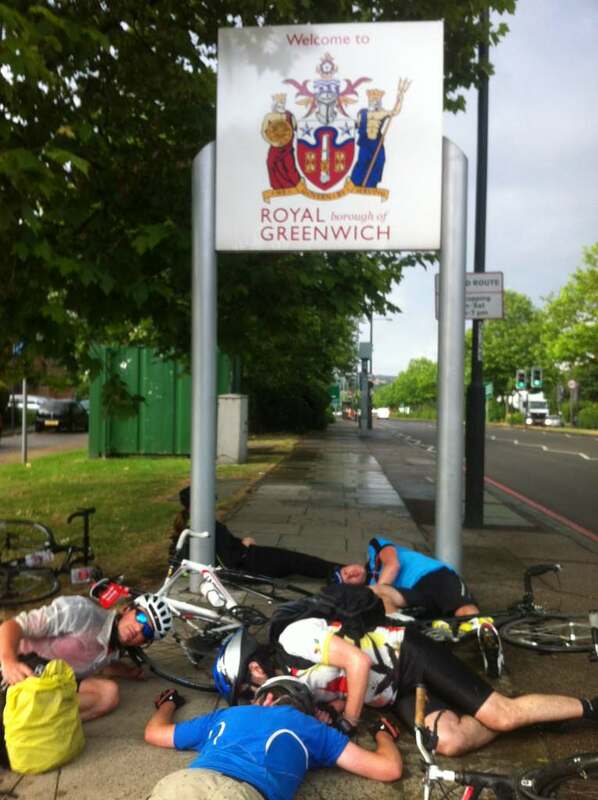 We cycled every one of London’s 33 boroughs (lets count City of London as a borough for the purposes of this write up!). 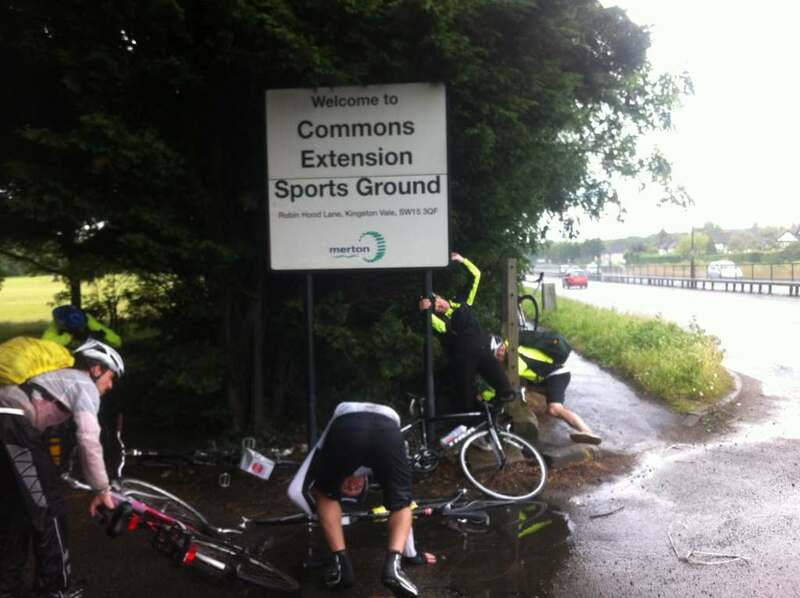 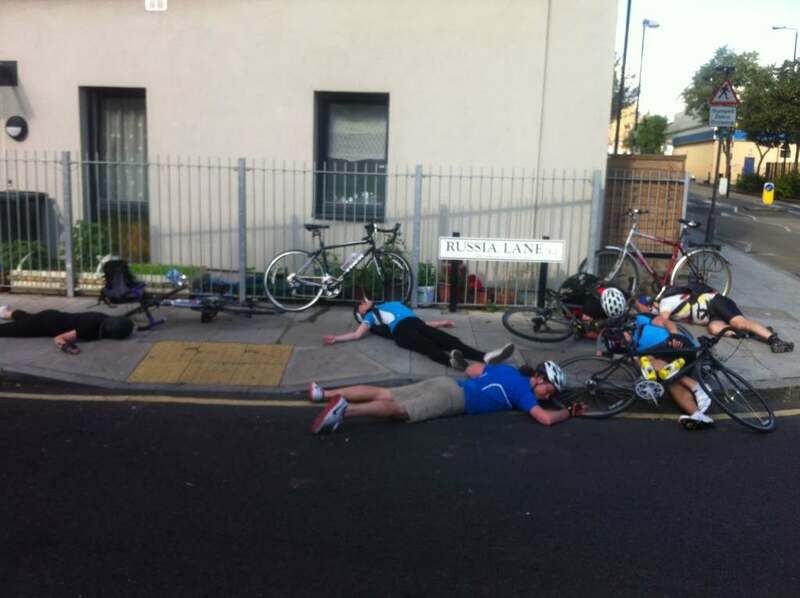 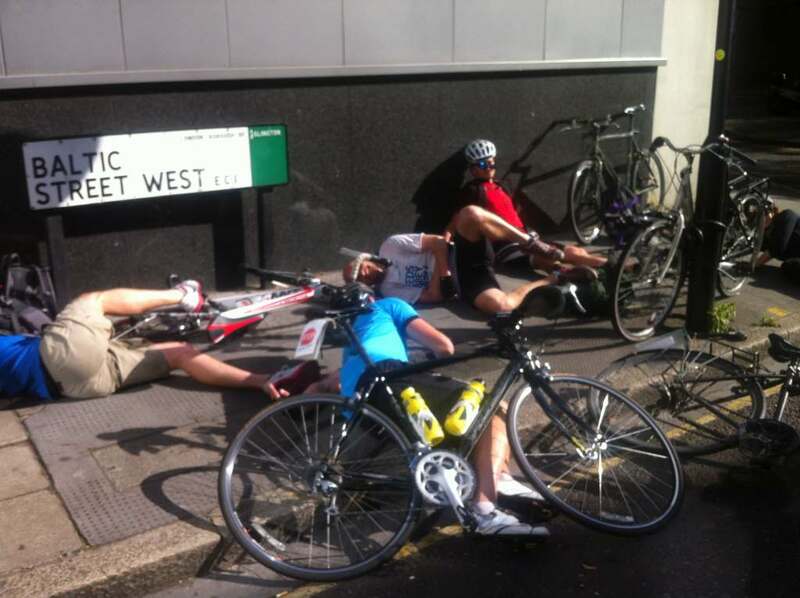 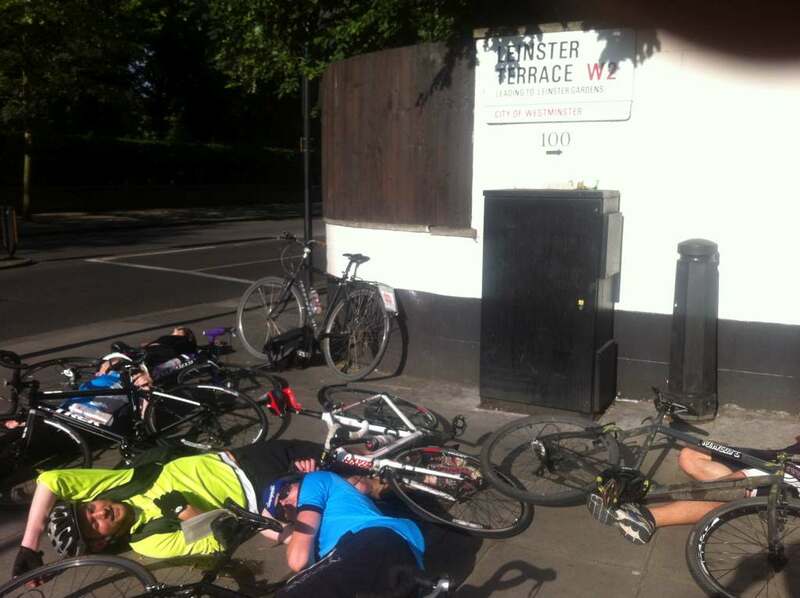 Seven people cycled the 95-mile route around and through London. 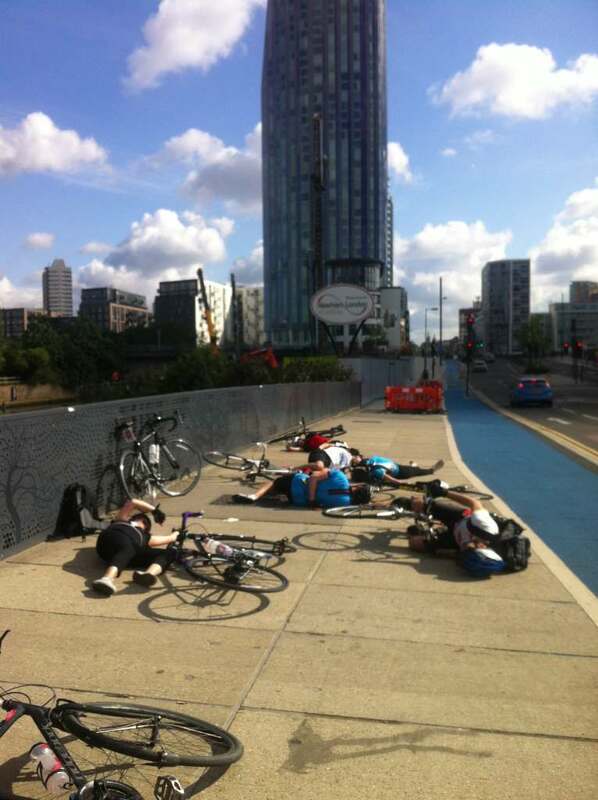 We’d done this before, in 2010 some friends and I mapped and cycled the shortest route for the first time- a 95 mile ‘e’ shaped ride starting in Hammersmith and Fulham. 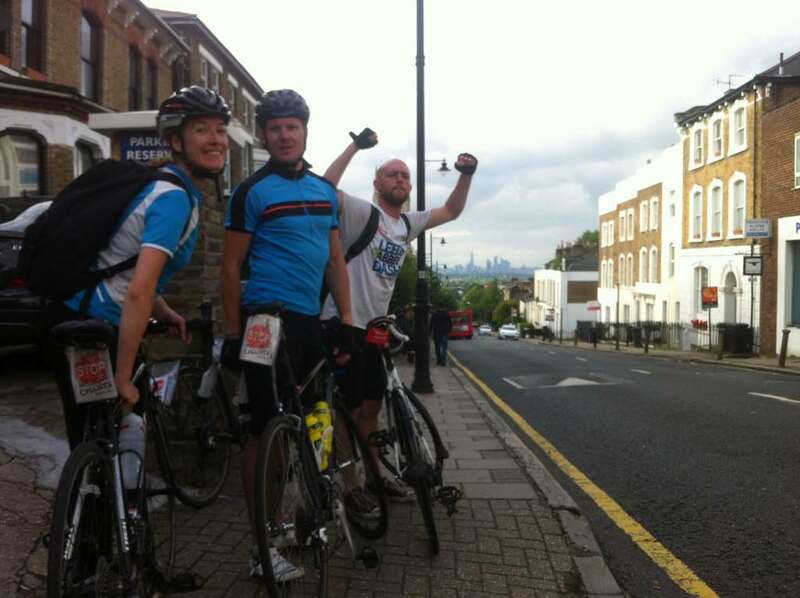 A few of us repeated the ride in 2012 and as 2014 rolled round it felt time to do it again. 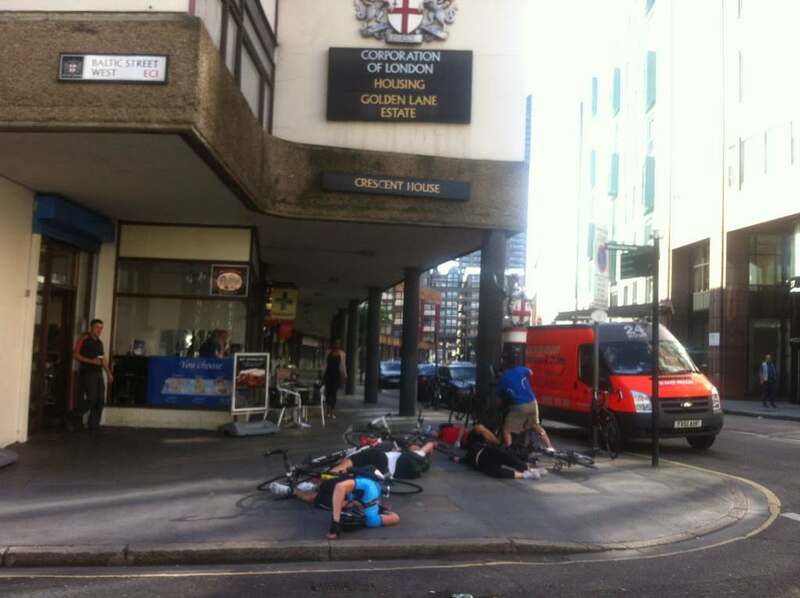 My partner, some friends and I had attended the first Stop Killing Cyclists ‘die-in’ outside the TFL offices in November and lay down on the pavement at Elephant in Castle in May. 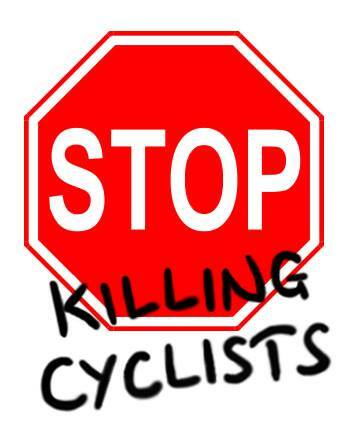 My friend Chris, who rode the first ‘Cycle The Boroughs’ with me in 2010 suggested that our 2014 ride would be a great opportunity to promote the Stop Killing Cyclists campaign. 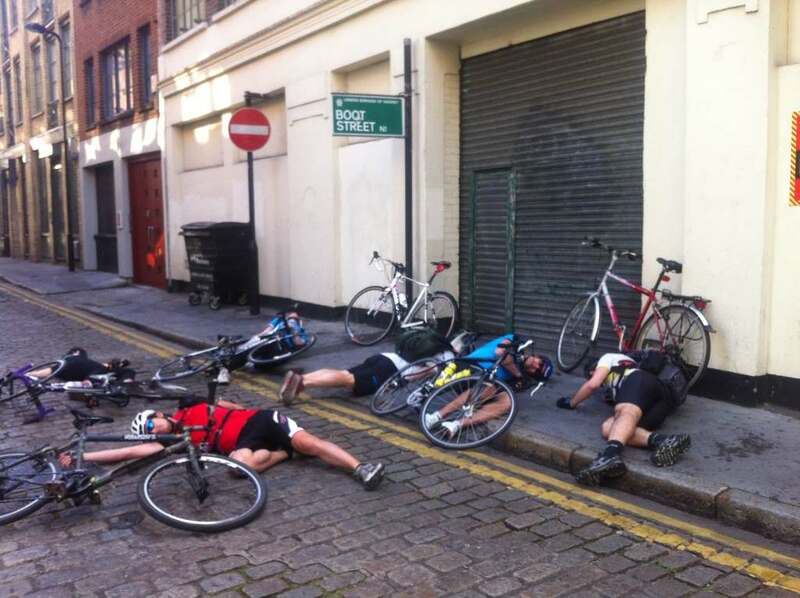 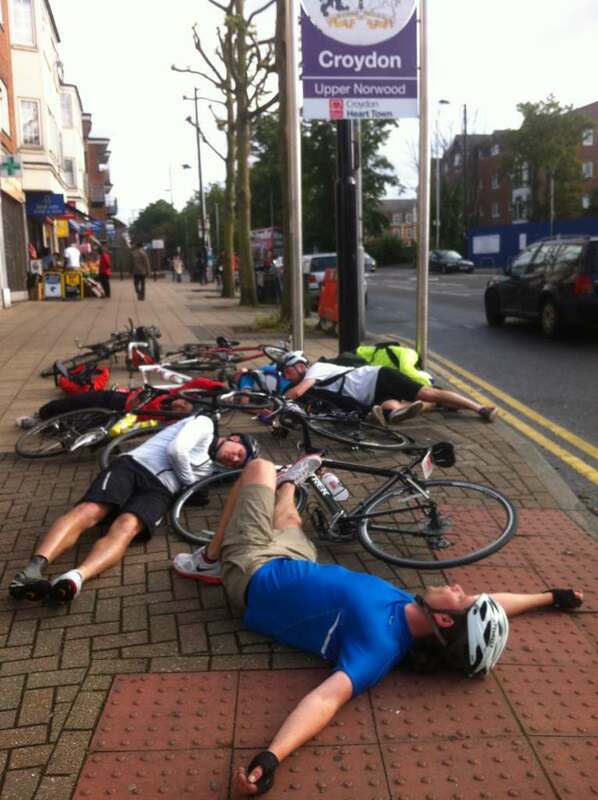 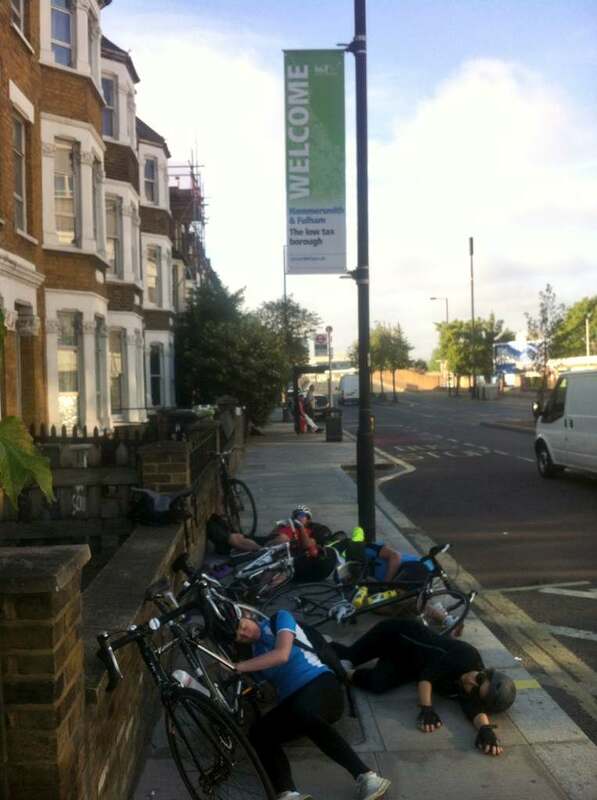 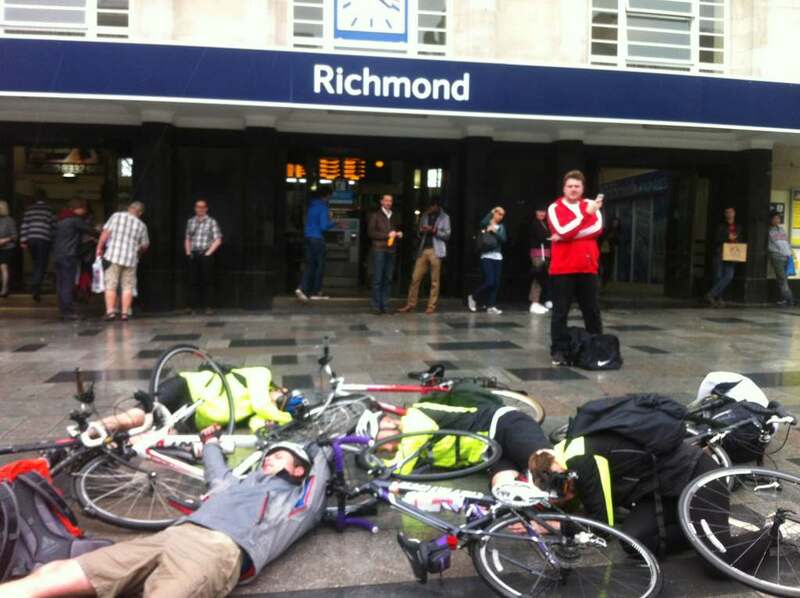 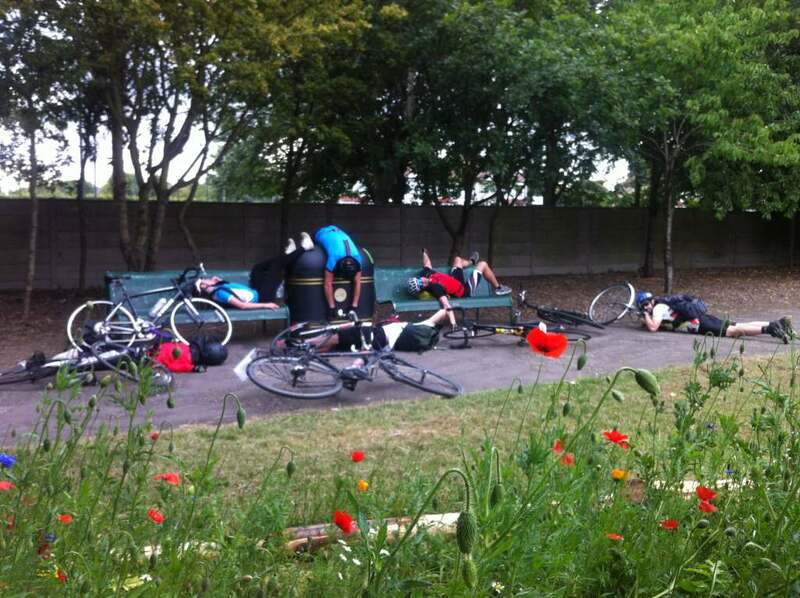 And so it came to be that seven cyclists and friends, four from the UK, a Pole, a German and an Italian set off from Willesden Junction at 7.15am on a bright Saturday morning to stage a public ‘die-in’ in every London borough. 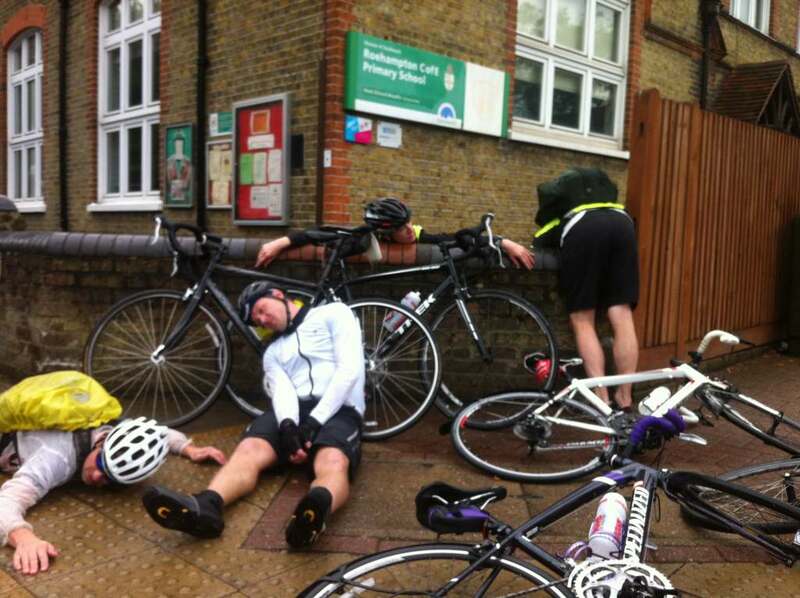 There was rain. 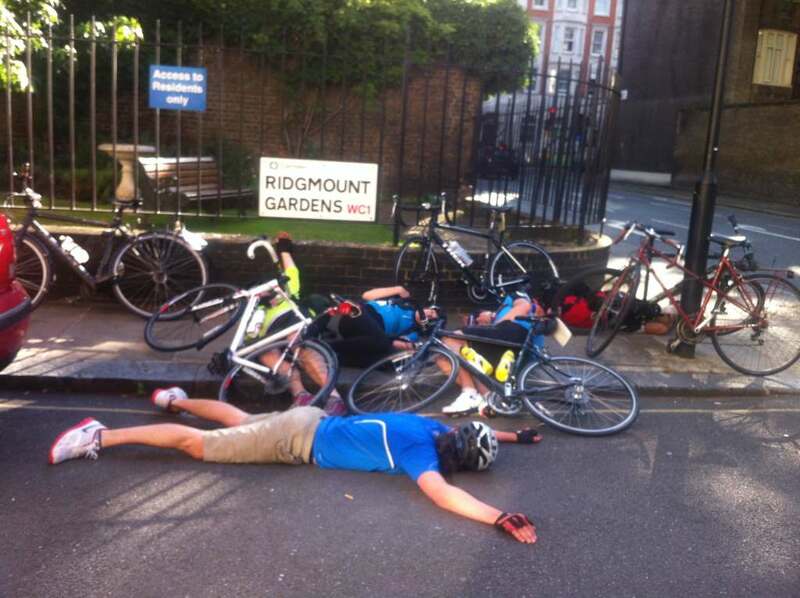 There was sun. 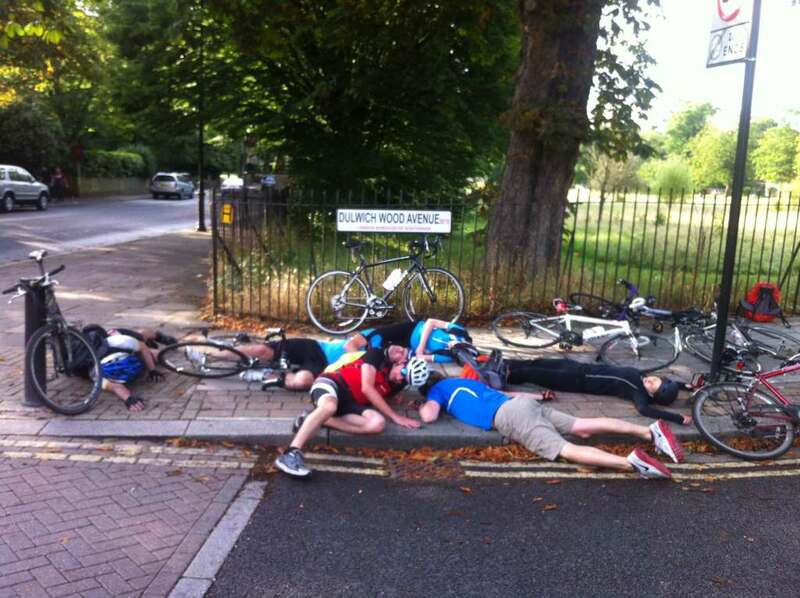 There was fun; with a serious message. 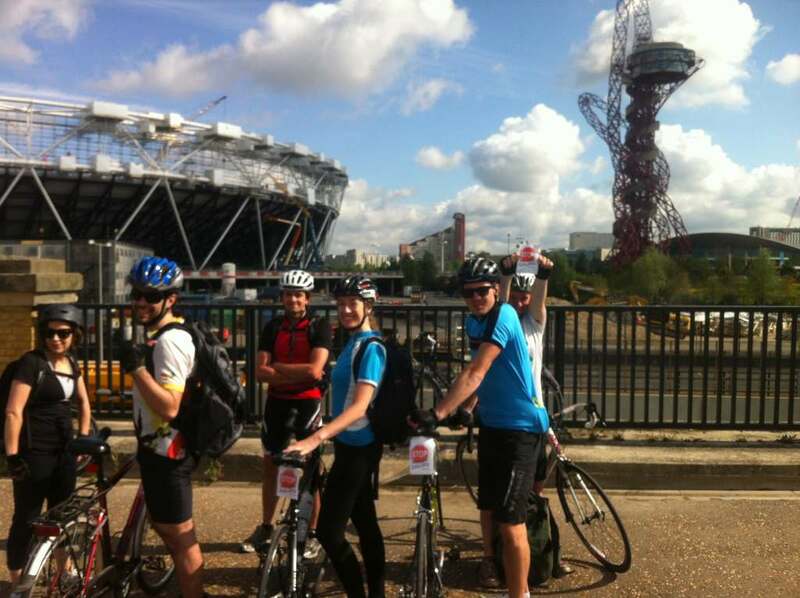 The route carried us along canal towpaths, through parks, on designated cycle routes and paths and along many minor and major streets and highways, sampling just about every sort of urban cycling experience there is to offer. 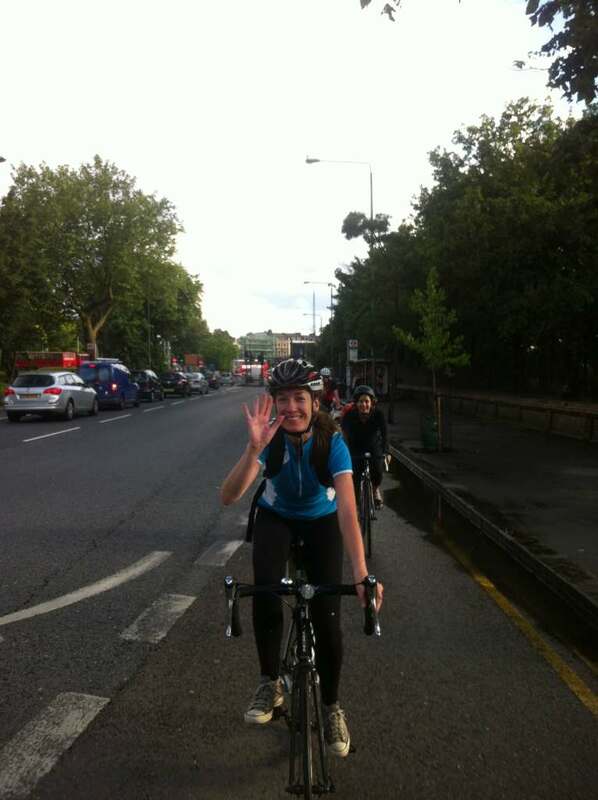 We began heading east from Hammersmith, a long straight route through the central boroughs north of Hyde Park, along an eerily empty Oxford Street, through Old Street, Victoria Park and past the Olympic site. 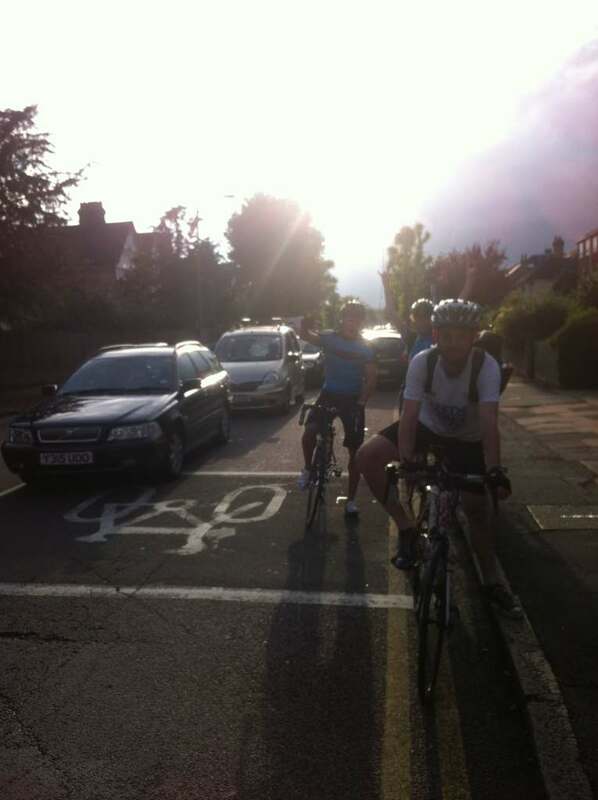 By Redbridge the sun bailed out behind an ominous looking cloud just as I swerved to narrowly miss a car door being flung open across the cycle lane. 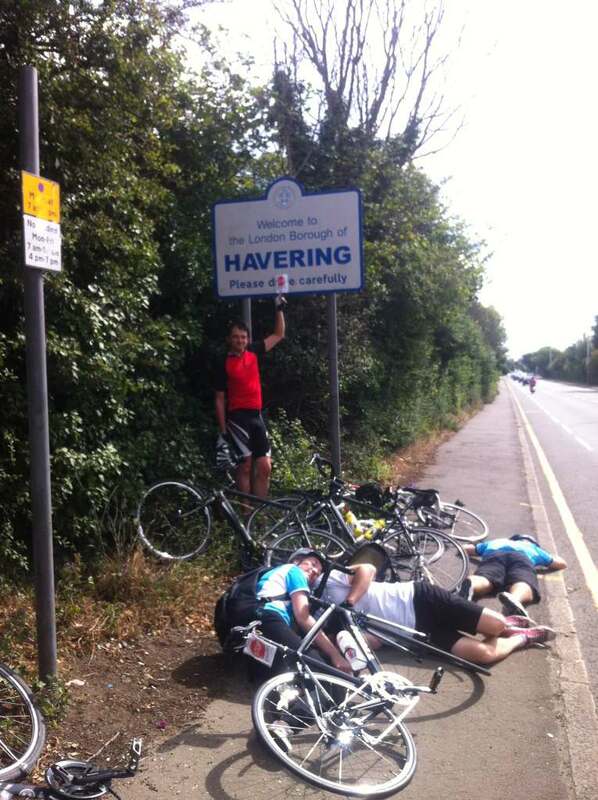 On reaching Havering we’d staged eleven die-ins, cycled about 25 miles, made a pit stop for espresso’s and more than burnt off breakfast. 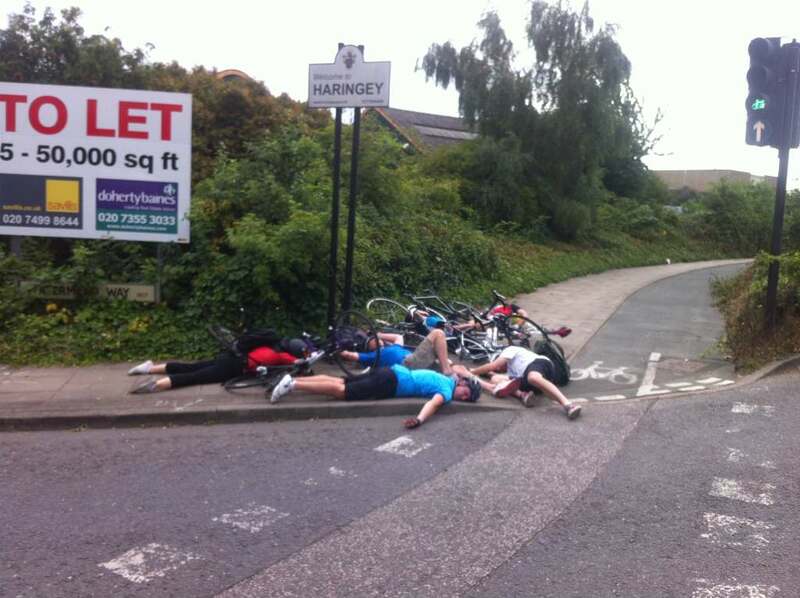 The group held a ‘Die-In’ in each borough that they visited. 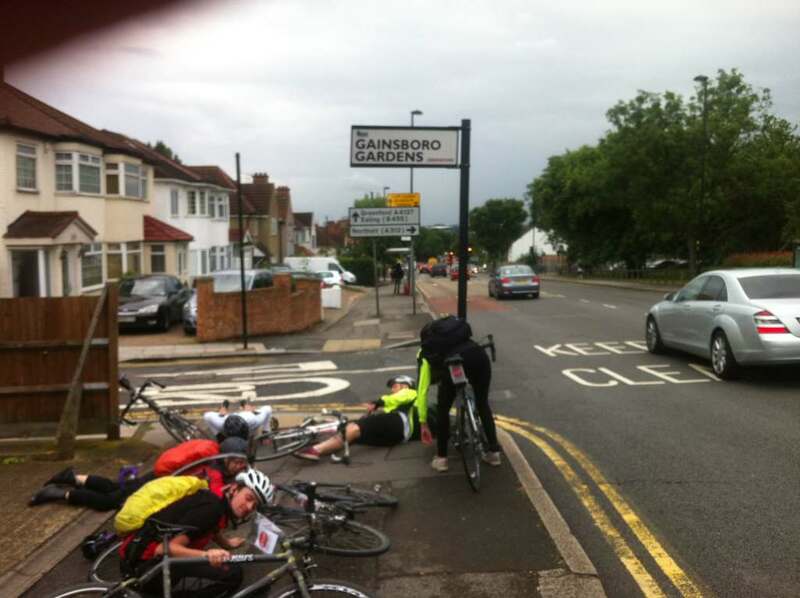 slowing our pace through very heavy traffic in Barnet and particularly aggressive driving in Finchley. 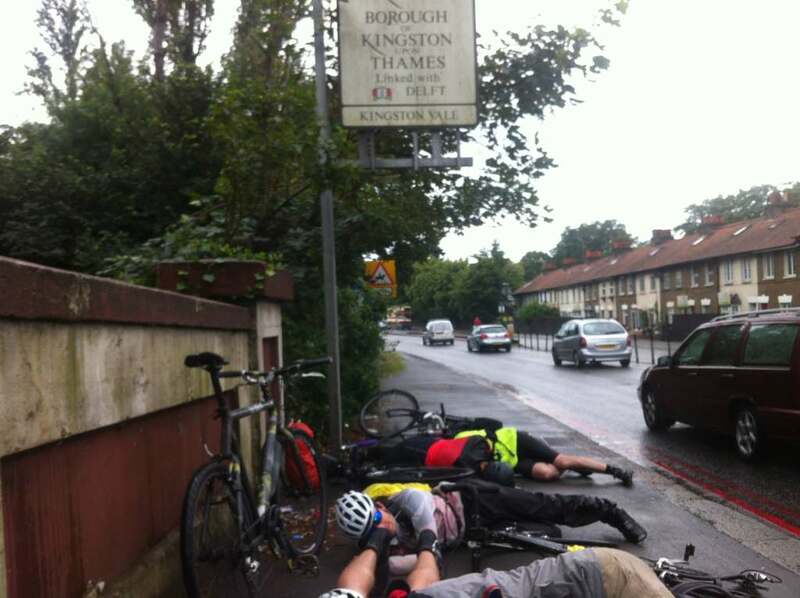 After our Ealing ‘die-in’ we peddled south through the western boroughs before crossing the river at Twickenham through another deluge. 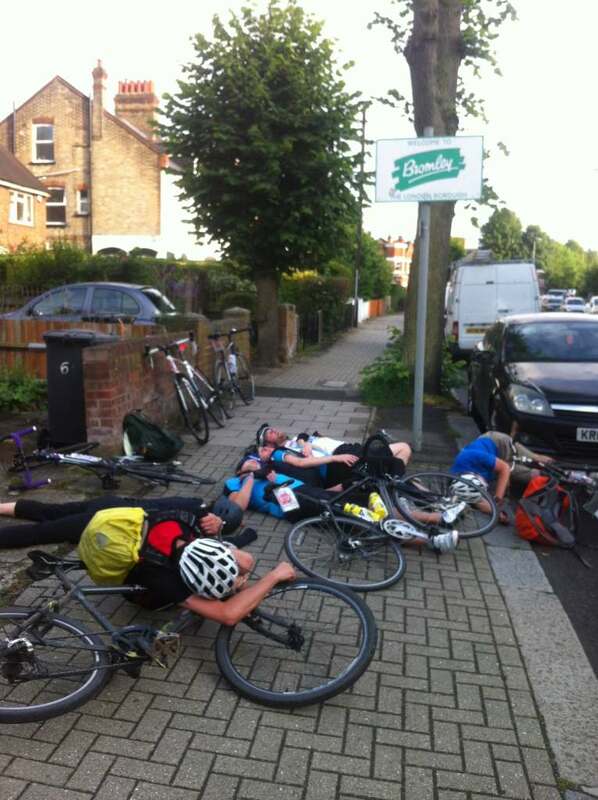 A welcome breather as we cycled through Richmond Park soon gave way to the thunderous roar of the A3 as we began to tick off the southern boroughs. 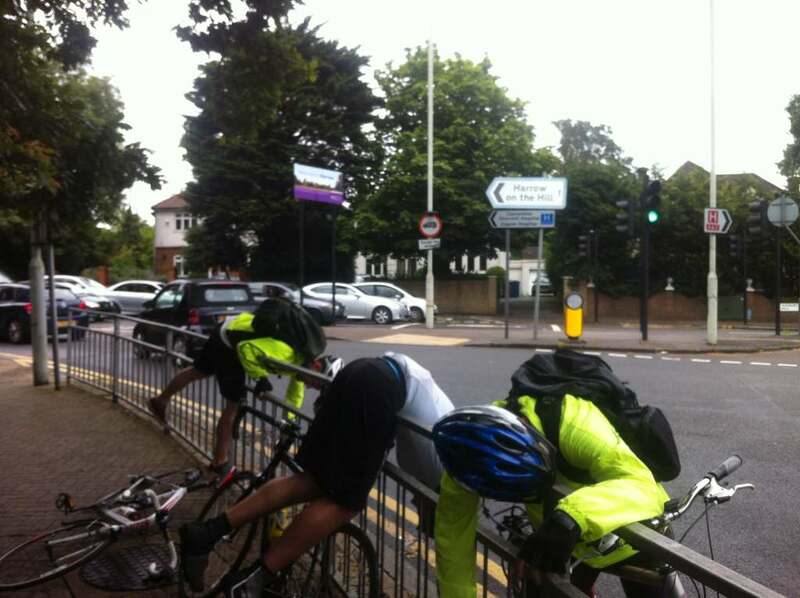 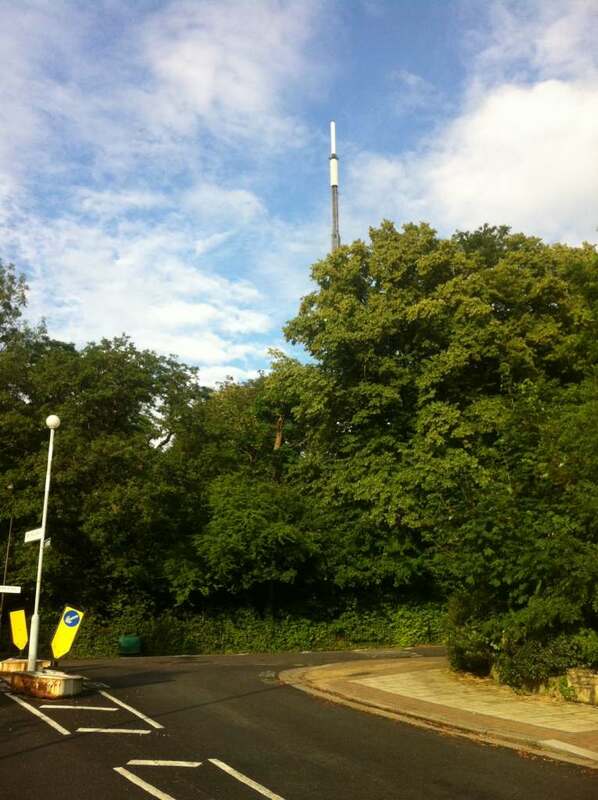 Passing through Merton, Sutton and Lambeth we knew that the greatest climb awaited; at Crystal Palace. 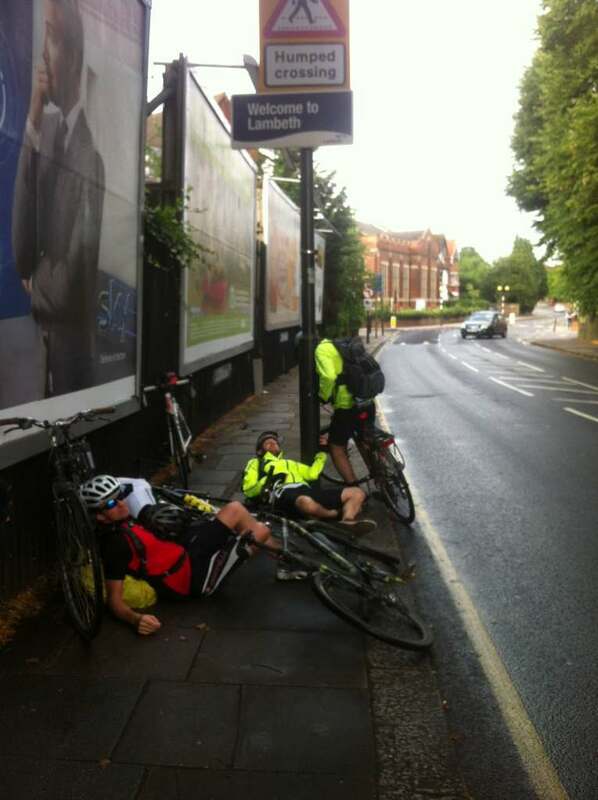 Thankfully the rain had stopped by this point and soon as were atop the hill we were speeding down the other side towards Sydenham. The sun returned for the first time since Waltham Forest giving us a much needed boost for the last stretch. 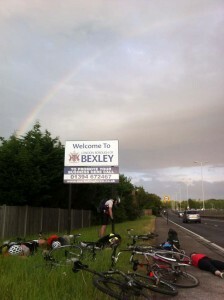 The section of the Green Ring we cycled to the South of Catford was a joy and a break from the traffic, noise and pollution that had plagued us on much of route. Approaching our final borough Bexley brought the unpleasant ride along the A20 and our only flat tyre of the day, just 3 miles before our finish at Sidcup Station. 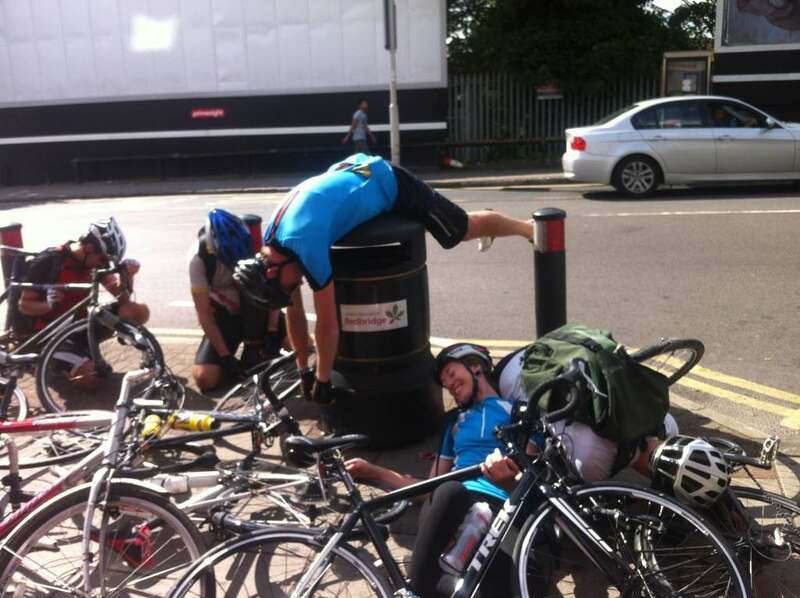 The journey had taken us over thirteen hours, slowed by the many traffic lights we encountered meaning that parts of the group were forever getting stuck behind a red while that others were left waiting up ahead. 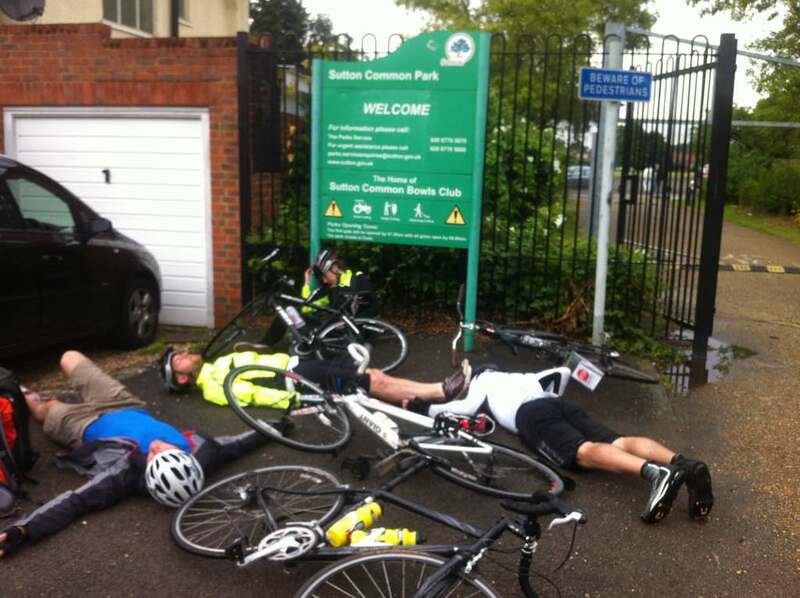 We completed the cycle on a collection of road bikes, hybrid bikes and mountain bikes. 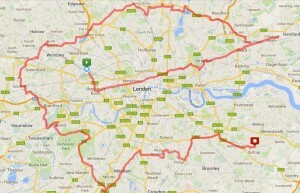 The cycle highlighted just how far there is to go in creating a safe cycling environment in London and the lack of improvement in cycling infrastructure in the 4 years since we first completed the route, which is even more scandalous considering the huge increase in numbers of cyclists in this time. 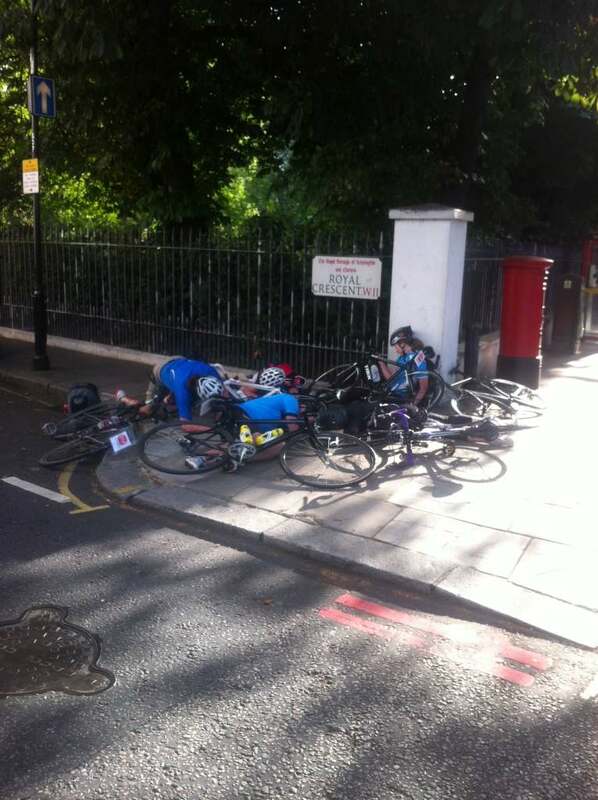 *The riders were: Adam Jukes, Jodie Cross, Jacob Przeklasa, Craig Horsfall, Laura Horsfall, Fabrizio Stefanoni, and Chris Speirs.